Population : 2.35 million (2016)-2nd lowest population density in the world. Majority follows Christian faith. The vast majority are Owambos, followed by Hereros, Kawangos, San, Nama, Damaras, etc. European settlers are mostly descendants of Dutch, German and South African immigrants and constitute about 7%. 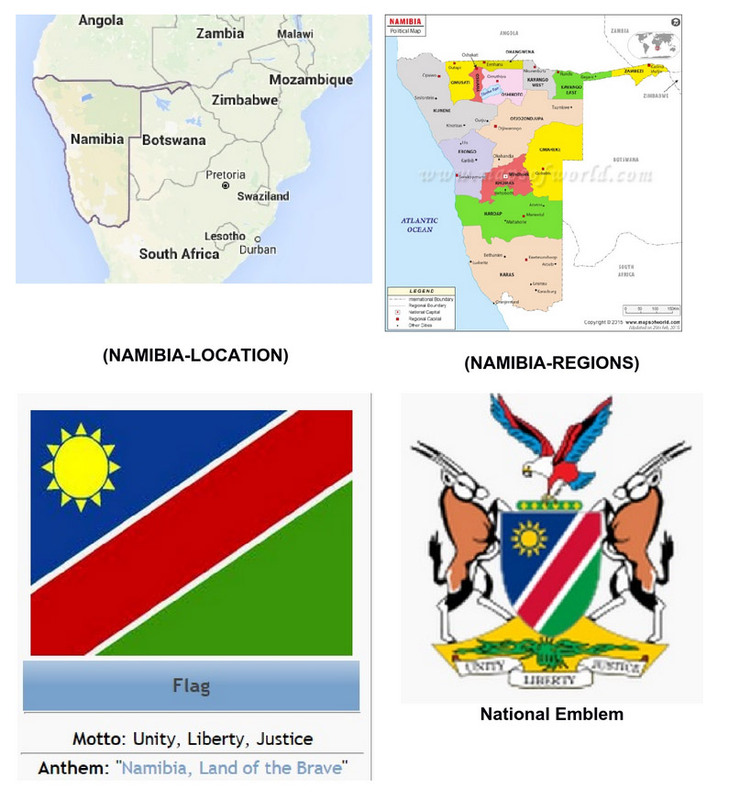 Form of government : Republic of Namibia is a constitutional democracy consisting of the executive (Cabinet), the legislative (Parliament) and the judiciary branches. The Cabinet is the executive organ of government, comprising the President, Vice-President, the Prime Minister and Ministers. The bicameral legislature consists of 104-member National Assembly (Lower House) and 42-member National Council (Upper House, three members from each of Namibia's 14 regions). Head of State/Govt. : H.E. Dr. Hage G. Geingob, President (since 21 March 2015). (President is both Head of State and Head of Government). He is the third President. He was also the first Prime Minister of Namibia. Political Parties : SWAPO (ruling party), Democratic Turnhalle Alliance (DTA), Republican Party(RP), Rally for Democracy and Progress (RDP), etc. Economy : The economy is heavily dependent on the extraction and processing of minerals for export. Mining accounts for 11.5% of GDP, but provides more than 50% of foreign exchange earnings. Namibia is 4 th largest exporter of non fuel minerals in Africa. Diamond deposits make Namibia a primary source for gem-quality diamonds. Namibia is the world's fifth-largest producer of uranium. Its economy remains integrated with economy of South Africa, as bulk of Namibia’s imports originate there. Namibia receives 30%- 40% of its revenues from the Southern African Customs Union (SACU). Namibian Dollar is pegged to S. African Rand at 1:1 ratio. It has a good transport and communication infrastructure. Manufacturing contributes about 11% to GDP but is held back by the small widely dispersed local market. More than 50% of population depends on agriculture for livelihood. Tourism is a rapidly growing area of economic activity. Trade-Imports : US$ 7.694 billion (2016); Major commodities: Foodstuffs; petroleum products and fuel, machinery and equipment, vehicle, vessels; Partners: South Africa, Botswana, Zambia, China, Norway and India. Exports : US$ 5.389 billion (2016); Major commodities: Diamonds, copper, gold, zinc, lead, uranium, cattle, processed fish, karakul skins; Partners: South Africa, Switzerland, Botswana. Classification : Upper Middle Income Country. (However, majority of Namibians still live in poverty because income inequality is very high. Gini coefficient index is 61.3% (2016).